From left are 2018 Miss Sternwheel Regatta Queen Alexis Meadows and Teen Sternwheel Regatta Queen Lexee Wray after being crowned Thursday night. POINT PLEASANT — The Point Pleasant Sternwheel Regatta had a royal first night on Thursday as titles were awarded in the miss and teen queen divisions for the festival. Alexis Meadows was named the 2018 Miss Sternwheel Regatta Queen. Meadows, of Point Pleasant, is the daughter of Steve and Karen Meadows. Also taking home a title in the miss division was Alisa Grady, of Buffalo, Miss Sternwheel Regatta Queen First Runner Up. Meadows was also named Miss Photogenic and McKenzie Roush, of Point Pleasant, was named Miss Congeniality. 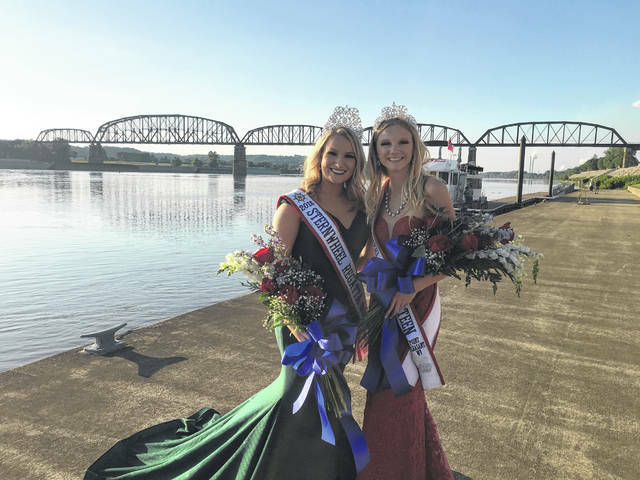 Lexee Wray was crowned the 2018 Sternwheel Regatta Teen Queen. Wray, of Apple Grove, is the daughter of Jason and Kristen Wray. Also taking home a title in the teen division were Jadyn Bowman, of Point Pleasant, Sternwheel Regatta Teen Queen First Runner Up and Olivia Brooks, of West Columbia, Sternwheel Regatta Teen Queen Second Runner Up. Bowman was also named Miss Photogenic and Brooks was also named Miss Photogenic. The junior royalty and pretty baby contests take place at 6 p.m. on Friday of the Regatta, also at Riverfront Park. Regatta pageants are under the direction of Delyssa Edwards. Also on Friday evening, live musical entertainment will be provided at the Riverfront Park by Devin Henry and Brown&Gray. Henry will be the opening act, performing at 8 p.m. The Headliners Brown&Gray will then take the stage at 9 p.m.
On Saturday, the day will start with the 5K/10K and Kids Fun Run at the Point Pleasant River Museum and Learning Center. Registration will be from 6:45-7:45 a.m.
At 11 a.m., the Regatta Parade will go through Main Street, line up is at 10 a.m. Patrick Morrisey, West Virginia Attorney General, will serve as this year’s parade grand marshal. At 11:30 a.m., a car show will be held on Main Street and kids games will be held at the empty lot beside Siders Jewelers. Also, a bouncy house for the children will be set up in the same lot from 10 a.m.- 6 p.m. The Riverside Cloggers will have a performance from 1-3 p.m. at the Riverfront Park Stage. At 3 p.m. a line throw contest will be held at the Point Pleasant River Museum. The sign ups for the line throw will be from 2:30-3 p.m.
Main Street Market Days will be set up on Main Street from 3-5 p.m., then from 5:30-7 p.m. a lip sync battle will be held at Riverfront Park Stage. Registration for the lip sync battle will be from 5-5:30 p.m.
A performance by popular local group Two River Junction will be held from 8-10 p.m. at Riverfront Park Stage with fireworks following at 10 p.m. at Tu-Endie-Wei State Park. Rockin’ Reggie will be set up on Fourth Street after the fireworks. As a reminder, admission to the regatta is free as are the concerts. https://www.mydailytribune.com/wp-content/uploads/sites/42/2018/06/web1_0629.Queens.jpgFrom left are 2018 Miss Sternwheel Regatta Queen Alexis Meadows and Teen Sternwheel Regatta Queen Lexee Wray after being crowned Thursday night.